Tricastin nuclear power centre. Steam rising from two cooling tower at a nuclear-powered uranium enrichment factory. The process of uranium enrichment requires large amounts of energy, and here this is supplied by nuclear reactors (not seen). The cooling towers are used to dispose of the waste heat. This is absorbed by water, which is sprayed into the cooling tower where it evaporates. Some of the water condenses and is reused, and some is lost as water vapour into the atmosphere. 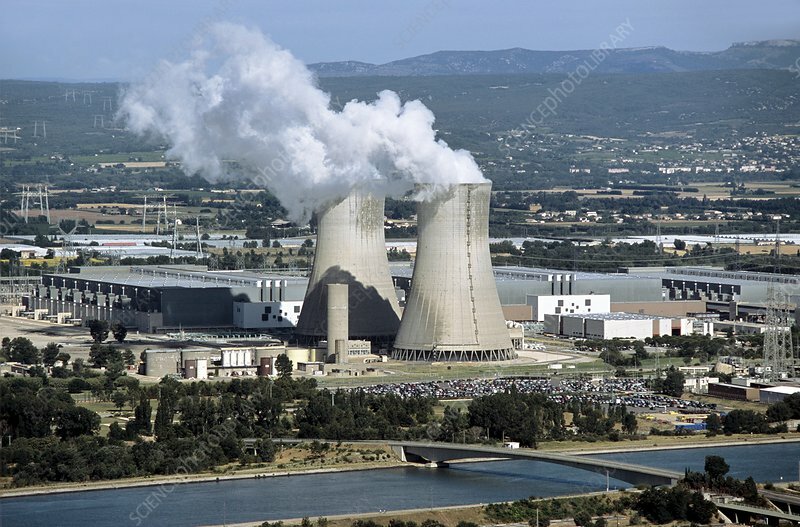 These cooling towers are for Eurodif's George Besse uranium enrichment factory. The Rhone's Donzere-Mondragon diversion canal (foreground) supplies water. Photographed in the Rhone Valley, France.